One of the biggest mistakes I made last year when I decided to go vegetarian for a month, was not doing enough research before I made the change. Which meant I ended up struggling to have enough energy. Fortunately, a quick email to a nutritionist friend put me on the right path. I needed to make sure I was getting enough protein. This year, I’ve adopted a more moderate approach to vegetarianism by going meatless on Mondays. It can be easy to rely on the old veggie protein favourites like eggs, lentils, cheese and beans. So here are some more unusual vegetarian protein sources to help you avoid falling into a meatless Monday rut, as it were. I’m always on the look out for excuses to eat more brussels sprouts, like these. Until I did some investigation, I didn’t know that brussels are one of the highest sources of protein for green vegetables. With a similar level of protein to brussels sprouts, kale is another great veggie to choose to help boost your protein intake. It’s cabbage cousins also contain some protein but aren’t as well endowed as kale. While I automatically think of soy and tofu for veggie protein, I hadn’t every linked the moreish green soy beans in Japanese restaurants with soy and protein. I tend to forget about seeds as a great nutritional source. While sesame and flax (linseeds) are no slouches in the protein department, sunflower seeds have the highest protein content. A recent Stonesoup commenter finds roasted sunflower seeds a great alternative to bacon. Need to investigate that one. Made from fermented soy beans, tempeh is even higher in protein than tofu and has the added bonus of a healthy does of microbes. The flavour is nutty and I find it much stronger than tofu. To be honest I’m still trying to find a great way to prepare it, so if you have any suggestions, I’d love to hear them in the comments. While nuts in general, contain decent amounts of protein, almonds contain the most protein and least carbs of the nut family. They’re wonderful as a snack or tossed in salads. Almond meal or ground almonds make a great gluten-free flour substitute in baking, such as in these chocolate muffins or my supermoist carrot cake. It’s also useful in savoury cooking. See the lentil balls below. Or try it instead of flour in your favourite fritter recipe. While not technically a grain, quinoa sure acts like one. With twice the protein content of rice, it weighs in with considerably higher protein than its grain siblings. I love the texture of cooked quinoa. If you’d like to learn more, you may find this post useful. Made from wheat protein, seitan can be made to have a similar texture to meat. People with gluten sensitivies should of course steer clear. I’m yet to find a source of it in Australia. And thanks to the lovely Mel from Dietriffic for inspiring this post. Don’t be alarmed by the appearance of these little lentil balls, they’re actually a lot more delicious than they look. The lentils, almond meal and egg combine to create a wonderfully satisfying ball texture. I’ve also used almond meal in actual meat balls instead of bread crumbs and was really happy with the results. If you need to feed some carnivores, soften a chopped onion and combine it with about 300g (10oz) minced (ground) beef and 75g almond meal. Shape into balls and bake in tomato passata as per the lentil ball recipe. I like to serve these simply in a bowl with parmsean on top and a green salad on the side. Feel free to serve tossed in with pasta, or zucchini noodles. 1. Preheat oven to 200C (400F). 2. Roughly mash lentils in a large bowl with a fork, then add almond meal and the egg. Mix and season. 3. Place tomato passata in the base of a large oven proof dish. Using a soup spoon, form the lentil mixture into small balls. Placing them in the sauce as you go. 4. Drizzle very generously with extra virgin olive oil and bake for about 20 minutes or until balls are firm and the sauce has reduced a little. I love a good aged sherry vinegar for my dressings but other wine vinegars or lemon juice are also good. 1. 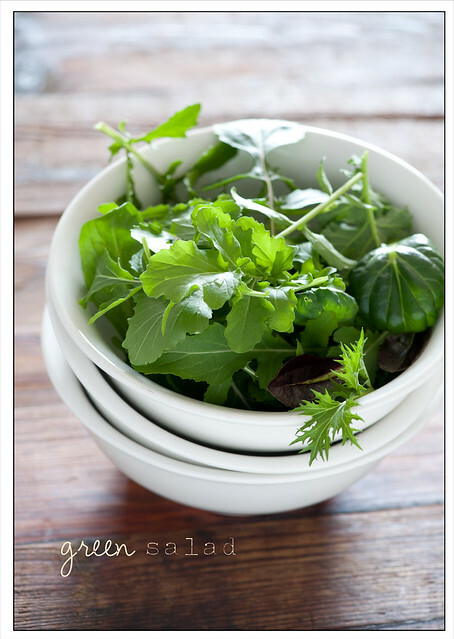 Combine vinegar and oil in the base of a salad bowl. Taste and season generously, remembering that the leaves are going to dilute the dressing. 2. Toss in the leaves to coat. My family has been making our own seitan for years (we call it gluten though :-) ). It’s actually not that difficult to do (just takes a little time and effort), and with a variety of options to cook it, can be pretty tasty. Will be happy to share a few recipes, if you’re interested. I love tempeh, unfortunately, I haven’t been able to find it since moving to Denmark. I have previously found seitan in a few health food shops around the place. As Michelle points out, you can make it yourself! (Here’s the long way and here’s the cheat’s way using gluten flour ;-) ). As for tempeh – it took me a few years to develop a liking for it. Now my favourite ways to cook it include nasi lemak, spicy tempeh broccolini pasta, tempeh lasagne, and marinated tempeh ‘bacon’. I’d suggest slicing it thinly, marinating it and frying to start. Great post! I have tried to make lentil balls once before and they turned to mush :( Will give it another go using your recipe. They look delicious! If you do some digging you will find variations on this recipe all over the place. As a full time vegetarian (or to be more accurate – a pescatarian) who lived in Indonesia back in my uni days, I love tempeh. Fabulous stuff. Sadly I can no longer get it through my previous supplier Food Connect, since the maker has moved south. Supermarket bought tempeh just isn’t as good. I love to just cut tempeh into around 1-2 cm thickness slices and shallow fry it. Indonesian Ketchup Manis (sweet soy sauce) makes a great topping / dipping sauce or even as a pre-cooking marinade. I usually serve it with a rice / noodle / vegatable stir fry. Enjoy! Gosh, these sound great and so simple. I’m going to give them a go tomorrow night! Wonderful! I’m always looking for new vegetarian sources of protein. I’m a first time commenter, and wanted to share two ideas for using tempeh. The first one is simple: cut in squares, stir fry in a little oil, then add soy sauce and let it soak in – delicious morsels. The second is more complicated. You make a stuffing of any vegetables cut into small pieces such as mushrooms, carrots, zucchini, onions. Add in crumbled tempeh and some cooked brown rice. Season however you want – I like thyme. Then steam cabbage or chard leaves. Put the stuffing in the leaves and roll up. Then I put tomato sauce and parmesan on top and bake for 30 min. A delicious vegetarian dish with all the nutrients you need. oooh i just bought kale! I have no idea how this was done, but I had an amazing tempeh reuben in a deli once. It’s actually quite difficult and overwhelming when you suddenly change your meal plan especially when you haven’t consulted your nutritionist or you just didn’t do some research before jumping into that change. I remembered my friend trying to be a pescetarian because it would make her lose more weight easier. So she started eating fish the next day right away thinking that the adjustment would be easy but it never worked. After a week she gave up. I should let her read this post here to give her some enlightenment. Thanks for this one! I especially liked the part where you started talking about protein and how to get it from other foods apart from the usual ones. Definitely trying those lentil balls! Looks so different and yummy. oh my goodness i LOVE tempeh. we make tempeh tacos (crumble and add taco seasonings as you would beef), tempeh bacon (http://kblog.lunchboxbunch.com/2009/06/tempeh-bacon-recipe-vegan-facon-makes.html), buffalo tempeh, oh man i could go on forever! one of my favorite finds since becoming a vegetarian. also love kale. kale chips are by far my new obsession. 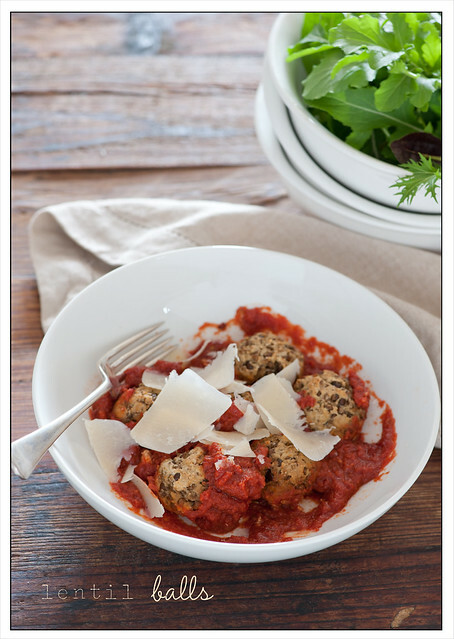 This lentil balls look awesome. I need to run to the store and get some almonds to grind up. I do miss making my own seitan. The slow-carb diet doesn’t allow wheat because of the high-glycemic index, but I’ll definitely be making the lentil balls this week. I just tried making the lentil balls, massive fail! They just weren’t hardening up in the oven, I’m now left with a mass slushy mess of passata mixed with lentil and almond meal! Maybe its because I tried making it vegan by using a flax egg?! Does anyone have any suggestions for my mush? So sorry you experienced lentil ball fail. I’m afraid the faux eggs are to blame. I tried a few different versions and it wasn’t until I started adding real eggs that I got the texture I was looking for. And thanks for the tempeh & Seitan suggestions everyone – some great information there! Thanks for the list! I’m not a vegetarian, and I certainly wasn’t aware of the protein in brussels sprouts or kale. I actually picked up some kale at the farmer’s market this weekend so I made a massaged kale salad today for lunch. That was a first, and both fun and delicious. Aw Jules, I was excited to see your lentil recipe when your post come up on FB, as I LOVE anything with lentils in it, only to find you had given me a wee mention…. THANK YOU!! No need, but a lovely surprise nonetheless :-) Recipe looks great BTW, I will be trying very soon. Yuuuuuummmmm! These look fab – i adore lentils – through them into everything i can to add extra protein and fibre. Will be making this tonight! Oh too good Jules. Love this idea. 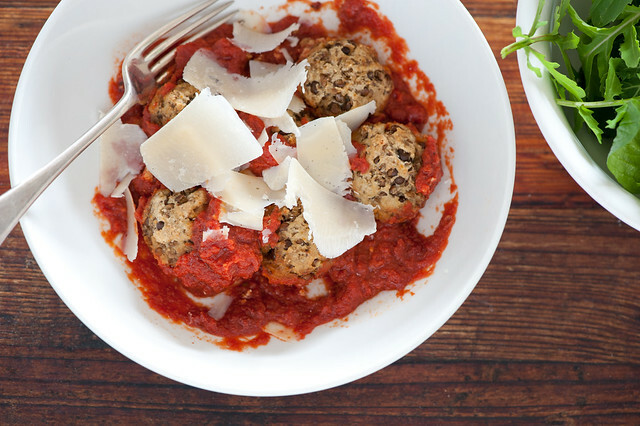 Pre-vegetarian days, my favourite meal was meat balls in tomato sauce so I’m always on the lookout for a good non-meat version. This looks just the ticket – I’ll be trying it out soon. Massaging kale hey? Hadn’t though of that and I have a big patch of kale in my garden so will have to try treating it with more love! There’s a restaurant in New York that just makes meatballs – called The Meatball Shop… they’ve inspired a lot of a meatball love in our chouse … but the thing is, I think I like my lentil balls even better… hope you enjoy! When I used to work in a health food store kitchen, I remember seeing tempeh for the first time and thinking there was no way I was ever putting that in my mouth. Well, after being taught to cube it, marinate it in tamari and fry until crispy, I became a convert. We also crumbled it into our vegetarian chili. I am pleased to find that brussels sprouts are high in protein – another tick for them! Protein is something that creeps into lots of food unexpectedly, which I learnt to appreciate once I became vegetarian and realised it wasn’t like eating meat when I just saw it as having a chunk of protein but rather a matter of combining lots of foods to get my intake. I am a bit ambivalent about tempeh but have found a few recipes I love with it – one is to fry it til crispy and then gently cook in a glaze (or fry til crispy and add to a gado gado plate. I also thought it was brilliant in this tempeh and corn soup – http://gggiraffe.blogspot.com/2010/12/buns-soup-and-crunchie-in-yazs-kitchen.html – and in these pies (that a friend of mine adapted from chicken pies he loved – http://gggiraffe.blogspot.com/2008/03/revolutionary-pot-pies.html. It seems to me that it doesn’t always work but when it does it is brilliant. those lentil balls look amazing.. Being an indian vegetarian, we get our daily dose of lentils and beans.. i love tempeh,almonds and quinoa.. yet to put brussel sprouts and kale into my daily cooking. I just made this recipe for dinner, and it was amazing! At first I never thought I’d try this one as they looked a bit unusual. But I watched the video you made and saw how easy it was. I used breadcrumbs instead of almond just because almond meal’s a bit expensive. I’m sure it would be even better with almond meal instead, though! I also cooked it in a pot on the stove because my kitchen is so tiny it doesn’t have an oven (So I really appreciated your no bake desserts too!). Thanks so much for the recipe, Jules! So glad you enjoyed! Yes I should have done a better job with the food styling to make them look pretty – but glad you decided to give them a go anyway. Hi Jules – just wondering if you think lentil balls can be made on the stove top instead of the oven. Being in HK, I don’t have an oven but would really like to try these. Great question. And yes absolutely! Just simmer gently in the sauce. Just the ticket for my vegetarian sister. So good to see your video and feel that confidence beaming out from the screen!! Worked so well for non veg spouse as well. The almond meal is just a magic ingredient here. This is definitely a keeper. it provided just enough bright contrast to the dish’s savoury flavours. Trying these lentil balls tonight,again another winner in the price department and with us trying more vegetarian dishes high in protein it was a winner. Loving it. I like to put cubed tempeh in stew – my husband eats meat so we usually make 2 meals and beef/tempeh stew is one of our favorites to make together. With plenty of broth and veggies (white potatoes, turnip, celery, onion, carrot) boiled for a while then thickened with a roux, the tempeh gets soft and chewy. I’ll eat it marinated and fried but I much prefer the texture after plenty of cooking. Thanks for the great lentil balls recipe! Made this for dinner with spagetti squash “noodles.” It was a big hit! I stumbled across this blog while searching for new ideas for cooking lentils. I grew up eating lots of lentils and legumes of all varieties, both fresh home grown and dried. All cooked the Italian way. Our 11 year old is still not keen on the texture of lentils but we’ll keep trying with new recipes. On the topic of tempeh, one of my favourite ways of cooking it is to marinade thin slices in a paste made with crushed garlic and salt in a mortar & pestel, then add dried turmeric and coriander powder to the mix. My Indonesian mother in law taught me this recipe. Once the tempeh is full of these flavours, it is deep fried nice and crunchy in a wok, but I prefer to shallow fry in a cast iron fry pan. Over the years I have tried my own variation of this recipe. I add olive oil to the marinade, then place the tempeh on an oven tray lined with baking paper and bake in the oven for at least 30 min(until crunchy) on high, turning once. I also do this with tofu. All my family love the tofu & tempeh cooked this way. Baking isn’t very quick, but it saves me time standing over the fry pan & the crunchiness makes it a family favourite. For more ways to cook tempeh I suggest searching “Indonesian tempeh recipes”. After all tempeh originated in Indonesia. thanks for the tempeh tips Maria! Made this tonight using a bed of excellent Rao’s brand marinara we can get in the States. I put a shake of Italian seasoning in the lentil mix which was nice (just dried herbs, no salt or weird fillers the. I salted separately). Also I have never seen canned lentils in the U.S. so I just boiled some up first. FYI I read that green or brown lentils double in weight when cooked … so around 7oz dry should yield the 14oz cooked that the recipe calls for. I served on a bed of spaghetti squash roses with olive oil that had been warmed with some slivers of garlic in it. Definite keeper recipe!